At a time when the Prime Minster has assured that women’s representation in the local government level will be increased by giving nomination to women up to 25%, some political parties keep complaining about women not coming forward and women not being capable enough to engage in politics and secure votes. It is crucial that the country encourage politically sensible and politically sound women to enter decision making institutions by taking special measures and creating conducive environment for them to engage in politics. For this purpose, the political parties have a very strong role to play in terms of recognising and grooming women politicians and giving them enough publicity and opportunity to get them into decision making bodies. Unfortunately, there is still a set of politicians in top ranks with a strong patriarchal and feudalistic mindset who claim that they have given the women in this country ‘their righteous place’ but not ‘equal place’. Recently in an interview with The Sunday Leader, a top profile politician of the SLFP said that in other parts of the world, women are fighting for equal rights probably because they have many issues in their countries – “but in our country, we rely on men to treat women justly. There is no doubt about that claim. When we look at the history of Sri Lanka, we can understand that it is a country built up on patriarchal ideologies, and we still have a patriarchy in this country. Women in this country should not get the equal position as men but should get the righteous place – which is a position more honoured than men’s place. We have great respect for the mother. In other countries, they give women an equal place; we give women their righteous place,” he said. The very same politician said he believes that women have more opportunity of winning when there is a few numbers of women contesting. “Logically speaking, the 51% or 52% of women in this country should be voting to appoint those few women candidates to the political institutions. Even if we give 1% of nominations as a party, ideally, all the women in the country should get together and vote those few women who are in the list and elect them – which is not happening. Increasing percentage does not increase their winning capacity. If the percentage is less, they have a more capacity for winning. 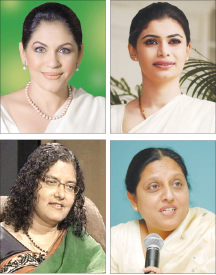 For example, in the Colombo District, the only women candidates from the UNP were Rosy Senanayake and Hirunika Premachandra, but Rosy Senanayake lost. Therefore, it is not only the decision of the party, but it is also the decision of the people of this country. The issue in this country is not about increasing nominations given to women. In our country, we often talk about things that are not practical and things that cannot be done,” he said. When their logic is such, the women of this country still have a long struggle to have their equitable representation in the political institutions despite the assurances given by the government. Speaking to The Sunday Leader, the founder of the Women and Media Collective and women’s rights activist, Kumuduni Samuel said that what women want is not to men to protect women from violence but to give them equal rights and protect the rights of women. She added that even though the Prime Minister has given certain assurances that he will increase the representation of women in local governments by 25%, the question is that the government has not really told how they will ensure women’s representation. “All we now know is that they may give 25% nominations. They haven’t even said that they will make amendments to the Local Government Act saying that all parties are bound to give 25% nominations. Even they give 25% of nominations to women, that does not mean all those 25% are going to win. That means they are not really increasing women’s representation by 25% even if we get a legally binding on nominations,” she added. Highlighting the question of democracy with reference to inequitable representation of women in political institutions at present, Samuel added that right now the question is not about the tendency of getting mothers and daughters of politicians or actresses into decision making bodies but increasing women’s representation in the political institutions. She added that the parties do not question the capability and suitability of men who they give nominations. “In the local government, there are 98% men. Many of those men who come to politics are somebody’s brother, son or friends etc. We do not even know who these people are or question what affiliations they have. In parliament, of 225 members, 212 are men. We also do not really ask the question how many of those men are from political families or how many of them actually speak in parliament and do something useful. We are now doing a parliament study – and we are shocked to see the amount of rubbish spoken in parliament as reported in the Hansards. Among those men who are in parliament, only about 10 or 12 parliamentarians actually speak. At glance, it seems that a less number of women are speaking in parliament, but if you actually look at 212 men, 200 of them are not doing anything. The rest of the men hardly do anything but when election comes they go campaign and throw money around and hoodwink the voter and get their votes,” she added. Samuel further noted that it is the responsibility of the political parties to identify capable women candidates and support them by giving them the opportunity to contest. “At the Local Government Level, the parties have the practice of nominating the sitting members of the local government to contest the election. 98% of the local government consists of men. Then we question how they create space for women?” she questioned. She highlighted the need for internal party democracy to identify active women within parties and groom capable women from the local government level, so that the parties do not have to parachute someone’s wife or daughter and actresses or popular female figures into politics. “Eran Wickramaratne and Harsha De Silva were not really party people. They were groomed and brought into parliament through the national list. This time, they were asked to contest the election as they were given the recognition from the party. But the parties rarely groom a woman,” Samuel pointed out. Speaking to The Sunday Leader, former Minister Rosy Senanayake insisted that the affirmative actions are the way forward if the country is to get women engaged in politics and increase women’s participation. “It is a lame excuse if the parties are saying that women are not coming forward. I believe that in every political party at the grassroots level, those who actually work and campaign for election are women. Women are in the forefront of the campaigns. There is a club that has trained more than over 3000 women from the North to the South and from the West to the East. Those women are trained and are ready to come forward,” she insisted. Senanyake added that the parties do not find it attractive to give nominations to women simply because of the prevailing electoral system which is not very conducive for women to engage in politics. She pointed out the countries that have taken affirmative actions to increase women’s representation in politics such as India, Pakistan, Nepal, and South American countries etc have dramatic increase in women in decision making bodies and have proven to reduced corruption and improve public welfare systems. She noted that especially at the local council level, women’s representation is important as women have a strong sense of the needs and aspirations of the community. “There are women who have the courage, commitment, determination and capacity to identify the needs of the community whether its water, sanitation, housing, education, or nutrition etc. Women participation is also proven to have reduced the level of corruption. India is the best example where men have stepped down to let women run the Council as women have proven to be worthy,” she pointed out. With reference to her situation during the last general election, she said she has absolutely no hiccups about not being voted to the parliament, and it is people’s loss. “Of course I do have a goal and aim for my work. But people did not realise the capacity I have. I am not the loser, the loser ultimately is the general public who did not see the worthiness of a woman who could give the fullest of her capacity,” she noted. She reiterated the need to have a paradigm shift with regard to the mindset and attitude of people in this country towards women to take women seriously and give women equal opportunity. Attorney-at-law and women’s rights activist Nimalka Fernando also noted that it is high time to take affirmative actions to increase women’s participation in politics, and the country is far behind when compared to South Asia. She too pointed out that despite the records on high level of education and improvements in other areas, Sri Lankan politics still remains feudalistic and patriarchal. Fernando added that other countries have started facilitating reservations and quotas for women in politics and started taking affirmative actions long time back whereas the Sri Lanka is still considering such a move. According to her, the affirmative actions to increase women’s representation will not be the end means, but it will facilitate a culture to include women in decision making bodies when it comes to politics – and the Sri Lankan voters will also be mobilised in the same way to vote for women. At this point of time, she said, the need is not only to take affirmative actions but also to create campaigns and voter education programmes to encourage women to be elected. “The current electoral system is highly patriarchal which blocks women from coming forward. It requires so much money and the election system still has male dominant approach. According to my observations, women have hardly any space to speak in our political platform,” she noted. She insisted that it is not only about increasing nominations given to women but also about recognising women leaders and identifying women with a political sense and understanding and encouraging them to engage in politics. Fernando also noted that every female community leader is not necessarily a good politician, but Sri Lanka has enough capable women with strong political sense who can be good leaders – therefore, it is the responsibility of the parties to identify them and create a platform for them to come forward.